I love SAABs, especially the Classic 900 and I hope this website shows off the vast spread of interesting models, styles and options available to the Classic 900 enthusiast. If you have any media that you think would be an asset to this website, please do get in touch with . You must be the intellectual property rights owner of the media and should include a note with your correspondence to the effect that you permit me to use the matierial on this website. Enough ... take me to the Special Editions! The 'Finlandia' was a prestige variant of the GLE, 30cm longer in the body than the standard car giving extra leg room to both the front and rear seats through hand lengthened front and rear doors. First shown at the Geneva International Motor Show in 1979 SAAB introduced their latest concept car - the Super Turbo. Based on the three door SAAB 900 Turbo, the concept combined the production 145 BHP turbo engine with the 250 BHP rally counterpart to raise power to 175 BHP with 267 lb ft of torque through high pressure turbocharging and water injection at full boost to cool the pistons and cylinder head by around 100C which guarded against pre-detonation. Secured with sensor to prevent the increased power in the event that the one gallon reservoir emptied, that amount was deemed sufficient for over 2000 miles of motoring. Aerodynamically designed 6.5" wide wheels with Pirelli P6 205/60 VR 15 low profile tyres provided the necessary grip for the increased power as well as a modified suspension setup and a deep front air dam. Further conceptual improvements included a full width high level rear brake light, fog lights, luxury interior with fully heated leather upholstery across all four seats, rear reading lamps on flexible stalks and time-delay courtesy lights. No doubt inspired by the Super Turbo SAAB Australia assembled a special version of the SAAB 900 Turbo - the Enduro. Limiting the assembly to 12 cars, the package consisted of very flared fenders to house wide wheels, auxilliary instruments (oil pressure, battery voltmeter and ammeter) mounted in the upper DIN slot, improved suspension and a high performance engine. To increase performance the wastegate was set at 17 PSI (1.2 bar) while the engine was equipped with a charge-cooling system whereby water was injected into the pre-throttle airflow guarding the engine against pre-detonation. During the autumn of 1981, SAAB dealers in the UK prepared a short run of cars based upon the GLE variant. Costing some £270 more than the standard model, these special editions were mostly four door saloons, paintwork finished in Indigo Blue metallic, Pine Green metallic or black highlighted with gold coachlines and Minilite-style alloy wheels. Launched also in 1981, SAAB dealers in the UK prepared a three door turbo variant, paintwork finished in Pine Green metallic with an exclusive graphics package featuring gold coachlines and gold coloured Minilite-style spoked wheels. These cars did not have the Gold name, as such; dealers were sent the car as demonstration models with the coach lines present in the boot in a white box. Inspired by the Super Turbo, 1981 saw an enhanced model of the SAAB 900 Turbo produced for the Swedish market. To increase performance the wastegate was setup to around 15 PSI (1 bar) while the engine was equipped with a charge-cooling system whereby water was injected into the pre-throttle airflow guarding the engine against pre-detonation. During the summer of 1982 to mark the 25th Anniversary, a run of 400 SAAB 900 turbo variants finished in Slate Blue metallic were imported into the US. These limited edition four door manual transmission models were further distinguished by colour coded alloy wheels and front spoiler, black rear spoiler, upgraded stereo, deep pile tan carpet mats, and a celetratory '25th Anniversary' emblem on the steering wheel and key fob. Lynx does lots of development work for manufacturers and that's how this one came about. Lynx briefly marketed the car as a conversion; just two were built. Five pre-production cars were prepared in Sweden based on the three-door variant, finished in pearlescent white with body-coloured Airflow bodykit and running the new 16V B202 engine producing 175 BHP. Exported from Sweden to the Netherlands. The Canadian special edition, known as the 'Sport' was based on the 1984 model year SAAB 900 eight valve fuel injected variant. Riding upon Shelby/Ronal wheels this model featured the three piece rear spoiler from the accessories catalogue of the day. While an unknown number of models were built, they can easily be identified by the distinctive metal 'Sport' badge upon the trunk. Experimental Vehicle number 1 was first shown to the public in 1985. Based on the SAAB 900 T16, the EV1 was redesigned into a two door 2+2 coupe which could happily accommodate four adults and a sizeable amount of luggage, noted as "unusual for this type of car" by designed Björn Envall. Power was increased to 285 BHP and gearing to a top speed of 168 MPH. New materials, such carbon fibre, were combined with glass fibre layers to form a strong yet lightweight shell. This futuristic styling was also functional with a bronze tinted glass roof permitting the charging of solar cells used to power interior comfort systems while reflecting heat away from the driver and passengers. Marking the 25th Anniversary of SAAB GB, 300 special edition models were produced for the UK market. Based on the fuel injected eight valve engine in a metallic silver two door variant with unique side strip incorporating the Swedish word for 25, "Tjugofem", this special edition sports a variety of additional equipment over and above the standard model of the day: interior upgrades included tinted glass, electric windows, electric mirrors and rear head restraints; exterior sported a rear boot spoiler and decor panel. The cars were individually numbered on a silver disc set into the top of the gear knob. Prepared by SAAB dealers in Belgium, the 'Beverly' edition specifications are: MY 1986/1987, four door saloon, sunroof, alloy wheels and central locking. Silver grey in colour with dark grey heated seats to compliment, sporting the turbo-style front and trunk spoiler, 15" US turbo-style alloys and sunroof with wind deflector. Aside from those features of the comfort pack, this eight-valve injection model also featured central locking and powered steering, but did not get the electric pack; manual window winders and mirrors. Despite the turbo-style alloys, car wore the standard injection model grille, not the chrome turbo-style type. This special edition features a unique 'beverly' badge in place of the normal boot emblem. Based on the Malachite Green two door saloon, this turbocharged eight valve model was launched by Swiss importers in 1986 as the 'Commander' Edition, typified by unique red side striping along the line of the car above the rubbing strip and distinctive 'Commander' decals on the boot lid and rear quarters of the car. Alongside the uprated Type M turbo specification (rated to 197 PS), this special edition sported wood dash fascia and gearknob, beige leather steering wheel and rode upon Super Inca wheels sitting infront of dealer-fitted mudflaps, although this edition did not have leather unholstery, electric pack, cruise control, air conditioning or a sunroof. Prepared by SAAB dealers in the US, 1986 saw the birth of the 'Executive' Edition. This turbocharged 16V B202 model sported a fully loaded interior with burgundy leather upholstery, electric pack, cruise control and air conditioning but with no exterior extras. It could be thought of as a poorman's SPG. Based on the two door turbocharged 16V B202 engine, Canadian importers produced a limited run of special editions in gleaming Cirrus White. The 'White Knight' Edition sported the full Airflow body kit, sunroof wind deflector, low level fog lamps moulded into the front bumper spoiler, body coloured wing mirrors, front grille, rear wedge spoiler and distinctive colour co-ordinated Super Inca wheels. To celebrate 40 years of SAAB car production Belgian SAAB dealers built a special jubileum model. Built around the turbocharged eight valve engine, this Rodonite/Garnett red model (colour code 213B) featured the electric pack, tan leather or biscuit plush velour interior, chrome turbo-style front grille, whaletail spoiler and rode upon Super Inca or Cross-spoke wheels. A special 'Jubilee' decal adorned the rear wings and each car had an individually numbered gear knob. 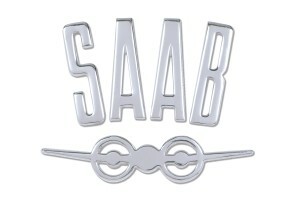 Sweden saw the launch of a special edition model to celebrate 50 years of SAAB in 1987. Riding upon Super Inca wheels, despite a low specification, this special edition model featured special gold paintwork this fuel injected eight valve was decorated with side striping, terminating in unique decals on the rear panels. This model should not be confused with the 40th Anniversary model of the same year, celebrating 40 years of SAAB car production. The less esoteric 1988 'Jubilee', released for the UK market and celebrating 50 years of SAAB remains the more "known" 50th Anniversary model. Inspired by the accessories catalogue of the era, the 'European' Edition sought to mimic the body styles of mainland Europe. Typically wearing the Airflow bodykit launched the same year in Europe, the 'European' Edition featured a very high interior comfort and accessory specification. The electric pack, sunroof, leather interior, walnut dash fascia, walnut or leather door caps, whaletail spoiler, rear vent covers and rear windscreen wiper were often featured on this special model, not to forget interior accessories such as gauge set, cassette holder and dash top assortment tray. Externally, the Airflow bodykit was often body coloured and the wheels usually Super Inca or Sunburst/Teardrop designs common on European cars. The SAAB 900 Jubilee was created to celebrate SAAB's 50th Anniversary. Riding upon Super Inca alloy wheels and internally fitted with buffalo leather seats, the car featured many items from the turbo model, including chromed turbo-style front grille, rear reflecting decor panel, sunroof wind diffuser and large whaletale spoiler. Finished in Odorado Grey, the car was decorated with grey and red stripes and sported a 50th Anniversary wreath motif. Inside, an individually numbered gear knob and 50th Anniversary logo in the middle of the steering wheel adorn the car as a celebration of 50 years of SAAB car production. An unknown number of 'Racer' models of the SAAB 900 were built for the Belgian market. Riding on Super Inca wheels, this eight valve turbo model features the Aero bodykit, a whaletail spoiler and comes with a unique 'racer' badge in place of the normal turbo boot emblem. A limited run of 150 models were built by Dutch SAAB importers to the specification known as the 'Red Arrow' although after the first 60 the whaletail spoiler became quite short in supply so a number of cars were produced with the smaller rubber spoiler. The Red Arrow featured the Airflow bodykit, Super Inca wheels, whaletail spoiler, black rubber coachlines, silver Red Arrow logos on the bonnet sides and the rear of the car, and an identification plate on the glove compartment. It is rumoured that the final 20 in the run were never produced. SAAB dealers enjoyed the springtime in Sweden and a special edition of the SAAB 900 Turbo Convertible finished in black with SPG trim and three-spoke Aero wheels was commissioned in honor of the event. Built for the 1988 Brussels Motor Show, this special two door model was available in Cirrus White or Marine Blue with Sunburst/Teardrop alloy wheels. Finished in Odorado Grey, these fuel injected eight valve models featured a high trim level, including a wooden gearknob, sunroof, electric windows and rear mirrors. Exterior details include the whaletail spoiler, Sunburst/Teardrop alloy wheels reflective rear numberplate surround and chrome front grille. While an unknown number of models were built, they can easily be identified by the distinctive side-striping and unique decals on the rear panels. Gothenburg dealers produced a very limited run of cars with the unique Vinga (or lighthouse) logo upon the rear wing. Based upon the normally aspirated 16V engine, and rated to 128 BHP with catalytic convertor, the Vinga sported the Airflow bodykit and the whaletail spoiler, riding upon Sunburst wheels. Like the 'Vinga', a very limited run of 30 cars were produced with the unique 'Wing' logo upon the rear wing. Red stripes adorned the entire length of the car, lead by small decorative aeroplane logos at the front of the bonnet. Based upon the Cirrus White eight valve turbo model, and rated to 140 BHP with catalytic convertor, the 'Wing' featured the electric pack, sunroof, whaletail spoiler and rode upon Aero wheels. The 158 BHP model was a special preparation of 100 cars made by EIA Motors of France. Using the normally aspirated 16V engine rated to 133 BHP, EIA ported and matched the intake manifolds from the turbocharged variant and exhaust manifold to a polished and flowed cylinder head. Performance camshafts, uprated fuel pressure regulator and short gear ratios produced a particularly sporty version of the car. SAAB dealers in the Netherlands prepared a special model based on the normally aspirated 16V, released as the 'Forty'. These three door hatchbacks were finished in Le Mans Blue and came with 'Forty' striping in light blue along the line of the body, short-spoke alloy wheels, electric pack, turbo spoilers and stabilizers. An unknown, but small, number of these cars were produced for MY 1989 in 1989 and 1990. Celebrating 10 years of the turbocharged 900, SAAB dealers in the UK prepared a special anniversary edition of the SAAB 900 Turbo model and the "run-out" model of the 8V B201 engine in the UK. Finished in black, stying effects include distinctive silver coachline stripes, sunroof visor, rear panel vent covers, whaletail spoiler and rear reflective decor panel. The turbocharged eight valve "Aero" model was made in Finland as a jubilee model specially for Swedish market. It sported the Aero bodykit, rear panel vent covers and rubber spoiler. Finished in Embassy Blue or Ultra-Marine and riding upon Minilite-style wheels, the 'Yacht Club' was a special limited run of 70 cars produced for the French market. The 'Yacht Club' was further adorned with a white contouring along the side of the car, terminating in the words "Yacht Club" at the C pillar. A Marine FM capable radio head unit was fitted to these cars which cost 143 500 FF, compared to 134 500 FF for the equivalent normally aspirated 16V of the day. Launched in May 1990, the 900 SE was based on the 900i but was kitted out as a luxurious top of the range model. As well as new dove grey leather seats (actually, not generally available until 1991), it had the rare 900 walnut veneer fascia inlay, walnut front and rear ashtray covers and switch pack, leather trim, rear wash/wipe and cross-spoked alloys. It was available only in metallic Iridium Blue, with a fine gold coachline down each side. The 900 SE came with ABS and an engine that gave 133 BHP. The British market received 300 such SE models. A limited number of 300 cars were exported to the US and European markets; each individually numbered. Finished in Platana Grey metallic or Monte Carlo Yellow with the Aero exterior trim. In Europe, while the specification did change from country to country, all the cars were Monte Carlo yellow in colour; no Platana Gray cars were offered in Europe. Following this initial run, a further number of Monte Carlo yellow cars were exported to the US, but these cars were not numbered. Launched in 1992, SAAB UK produced an Aero-styled 900i. Based on the normally aspirated 16V engine, this car became known as the 900i "Aero". Produced for one year, a small number of these models were made. In 1992, SAAB UK produced an Aero-styled 900i. This car became known as the 900i "Aero". The following year, Australia followed suit and for one year, produced a small number of these models based on the 2.1 16V normally aspirated engine, rated to 140 BHP. Produced in 1992 for the Norwegian market this 900i model was based on the four door 2.1 16V normally aspirated engine, rated to 140 BHP. Sporting a black stripe along the side of the car and a distinctive 'Griffin' logo on the rear, to the left of the SAAB Scania rondel, a chromed turbo-style radiator grille was also apparent. The 900 'Ruby' was the ultimate Classic 900. Offered in mica metallic Ruby Red (colour code 242), it used the 185 BHP turbo engine, but kept the pure lines of the 900, with no body kit. Features included air conditioning, Zegna wool seat trim inserts, lowered suspension, three-hole alloys with unique graphite finish and the car was fully loaded with electrically powered options. The list price of £19.995 made it the most expensive 900 ever and the model is now highly prized. Alongside the UK 'Ruby' Edition SAAB produced a further 15 models in mica metallic Ruby red (colour code 242) with the same specifications as the UK 'Ruby' Edition; eight for the Swedish market and seven destined for mainland Europe. The interior was most refined. Along with the Zegna wool seat inserts and electric seats, the knee board was much more finished and quite unique. A further 50 examples of the T16S specification in black (colour code 170) were produced as a special edition, sporting the Aero bodykit and built around the B202R3 engine, rated at 185 BHP. For the French market a limited edition GT model was built, also known as the 'TSR U9'. Riding upon dark gray centered rotational Aero alloy wheels, 70 cars were produced, all in black with black leather upholstered interior with Zegna cloth seat inserts (as were also found on the UK 'Ruby' Edition). The exhaust was the twin chrome tipped type, as seen on the UK 'Carlsson' Edition. All were sold in 1993 to celebrate the end of the Classic 900. Germany had the 'Last' Edition in 1993. The car was a black 185 HP variant ( although listed as 180 HP in Germany), the same engine as the 'Ruby' Edition of the UK and the same look as T16S. The interior sported leather seats with Zegna wool insert, as per the 'Ruby' edition and like the 'Ruby' the wheels were grey inset asymmetrical Aero alloys. In the spring of 1993 a commemorative edition was offered in the US. This special edition was only available as a three door turbocharged variant with a manual five speed transmission ... in black, of course. With 185 BHP it was the highest performing SAAB 900 ever, and along with an improved suspension and special alloy wheels with grey centres and polished outer it became the quintessential SAAB 900 Turbo. Only 325 examples were produced, each one numbered with a Commemorative Edition plaque on the wooden glove box face matching the wooden dash fascia. A final commemorative edition was introduced in September 1994. Like the three door Commemorative Edition of 1993, this special convertible is powered by the 185 BHP Turbo engine with a manual five speed transmission and includes the Commemorative Edition alloy wheels and wooden instrument panel fascia but without the matching wooden glove box face. Finished in a special black metallic paint, with tan leather upholstery highlighted by charcoal piping and matching tan convertible roof. 500 Commemorative Edition SAAB 900 Turbo Convertibles were imported. First shown in May, in production and on sale by the autumn of 1978 for the 1979 model year, was the all new SAAB 900. Based on the SAAB 99 and similar for much of the car, internally and forward of the A pillars it was an entirely new body. Design, comfort and safety were the key principles of the new SAAB 900 which featured an ergonomically designed curved instrument panel that put all controls into logical groupings and within easy reach of the driver. The steering column was telescopically collapsible with deformable steel bellows. In the event of a collision, the steering wheel is drawn away from the driver to minimise the risk of chest and head injuries. For comfort a new heating and ventilation system, and another SAAB industry first - a pollen filter for air conditioning. Performance of the SAAB 900 available in either three or five door hatchback (Combi Coupe, to use the '99' terminology) was as follows: GL specification as a single carburetted engine producing 100 BHP, GLS with 108 BHP from a twin-carburetter, the fuel-injected EMS delivering 118 BHP (same as the GLE) and the flagship Turbo model with 145 BHP turbocharged engine, all two litre inline slant four. Available in Cardinal Red metallic and Dark Grey metallic paint, the UK versions of the EMS did not have the luxury of power-assisted steering although in Sweden the EMS was available in Acacia Green metallic paint, with power-assisted steering. External changes were dual tail lamps and a new grille design while under the bonnet an optional five-speed gearbox was available to the EMS and turbo. The two-tone De Luxe model was a dealer enhanced paint option, with the lower portion of the car re-painted a complimentary colour contrasting with the standard factory paint finish. A popular choice for the two-tone paint was Slate Blue metallic above and silver below the belt line, while sometimes particularly decorative re-spraying was sometimes offered through stripes and motifs worked into the design. Riding upon Minilite-style wheels, the Lux also sported a slim black rubber stripe along the entire length of the car. The SAAB APC System, when optionally installed as a factory tuned 'Type M' specification, produced 195 BHP on the turbocharged B201 engine. This tuning option was available between 1986 and 1989 for the facelifted classic SAAB 900 and such legendary performance was often complemented by the more aerodynamic looks of the Aero and Airflow bodykits, whaletail spoiler and other 'sporty' accessories, such as rear louvres and vent covers. The SAAB 900 T16S two door; of which only around 300 of this limited run were produced and only sold in the UK. Produced in black this T16S model rides upon Aero wheels and around 150 were fitted with the factory option sports pack and 50 with the Airflow bodykit. All Aero specification cars imported into Switzerland during the 1988-1990 period were adorned with a distinctive Aero logo on the rear quarter of the bodykit. The specification was applied to all colours of car, notably white, black, red and metallic silver models - the bumpers, bodykit and wheel arch flares were colour co-ordinated with the car. This UK market special was named after rally legend Eric Carlsson. Based on the three-door shell and launched in 1990, it had an uprated 1985cc turbocharged engine with APC, and 185 BHP pumping out through twin chrome exhausts. A special body kit consisiting of front and rear under-bumper aprons, and side skirts based on the Airflow bodykit, distinguished it from the T16 or 'Aero' body kit. Available in black, white or red, the first batch had enlarged rear spoilers, rear infill lamp panels, 'Carlsson' stickers, and red side stripes. The car also had lowered suspension. In its second year, the 'Carlsson' Edition gained suede and leather-trimmed seats and, in 1992, a changed wheel specification. Many came with a three-spoke, wood-rimmed, Nardi-style steering wheel. Built at Nystad in Finland, the SAAB 900c continued the use carburettors to power the engine long after fuel injection was commonplace on the SAAB 900 and ran through to 1989. Based on the B201 eight valve engine and producing 100 BHP for the two litre block this variant sported a unique '900c' badge on the left hand side of the boot. Although produced for the Scandinavian market, examples of the SAAB 900c can be found across mainland Europe. Designated for the Italian market, the SAAB 900ep embodies the spirit of SAAB 'ecopower' and sports a distinctive 'ep' badge on the rear of the car. Based upon the 16V B202 light-pressure turbo engine, the 'ep' features a pre-heated catalyser. Examples of the SAAB 900ep can be found across mainland Europe; notably, the Netherlands. Manufactured by Ky Leo Laine Lokari-tuote Oy (Finland) and retailed by Oy Saab-Valmet AB (Finland) the SAAB 006 was aimed at 8-14 year old children. The modus operandi for this SAAB model is to cited in brochure as an important learning platform to teach children safe driving and giving them an opportunity to practice not only driving but maintaining a vehicle; important lessons for later life. SAAB specified in the brochure that the "Turbo 006 is not a toy", and it is powered by a four-stroke engine. The specification is detailed as a 3.5 BHP 127 CC engine with a rev limit of 3300 RPM and a top speed of 35 KPH (22 MPH). Manufactured by Toy Toys of Italy, a line of lightweight (around 6 Kg) steel frame plastic shell children's go-karts were produced. Sporting the distinctive look of the SAAB 900 from the grille to the angled slope of the convertible boot, these go-karts were badged up as turbo variants. The SAAB Friction Tester was a special vehicle fitted with a fifth wheel at the rear and designed for testing airport runway surfaces. Data-processing equipment allowed for the analysis of the runway surface; in terms of skid, water planing and braking conditions. Installed into the three door SAAB 900 and painted in high-visibility colours, several hundred of the cars were made and sold to airport authorities worldwide. During the 1980s, Volvo performance parts and accessories reseller ipd turned their attention the SAAB. With the help of Ove Hassellberg of SAAB, power was increased by raising the boost ceiling from the standard 7 PSI to around 13 PSI, stabilised with a Spearco water injection system and Callaway Turbofueller. Statistics showed an improvement in the 0-60 times from 10.5 down to 9.4 and quarter mile times from 17.8 to an impressive 17.2.
ipd worked with partners to develop an adjustable rear anti-roll bar and a non-adjustable front bar to compliment the all round lowered suspension including shock absorbers supplied and specially valved by Bilstein. Pirelli P7 205/50VR-15 tyres gave the car the necessary road handling. Exterior styling hints included the company themed blue striping and matching blue alloy wheels, and Hella sourced European square halogen headlamps and a rear windscreen shadow louvre. Sporting The Winchester Label upon the boot, adjacent to the model designation, Winchester SAAB cars were distinguished by a high quality, distinctive prestige internal wood pack. The dash fascia, glovebox face, door caps and central console insert were covered in a highly polished walnut burr veneer. Again, The Winchester Label upon the glovebox denoted the company's seal of approval to the interior styling.